Three films that tackle design in three different industries. Helvetica is a feature-length independent film about typography, graphic design and global visual culture. It looks at the proliferation of one typeface as part of a larger conversation about the way type affects our lives. Urbanized is a feature-length documentary about the design of cities, which looks at the issues and strategies behind urban design and features some of the world's foremost architects, planners, policymakers, builders, and thinkers. “We all get dressed for Bill,” says Vogue editrix Anna Wintour. The “Bill” in question is 80+ New York Times photographer Bill Cunningham. ... Cunningham’s enormous body of work is more reliable than any catwalk as an expression of time, place and individual flair. In turn, Bill Cunningham New York is a delicate, funny and often poignant portrait of a dedicated artist whose only wealth is his own humanity and unassuming grace. Between the Folds chronicles the stories of ten fine artists and intrepid theoretical scientists who have abandoned careers and scoffed at hard–earned graduate degrees—all to forge unconventional lives as modern–day paperfolders. As they converge on the unlikely medium of origami, these artists and scientists reinterpret the world in paper, and bring forth a bold mix of sensibilities towards art, expressiveness, creativity and meaning. A look at the life and work of graphic designer Milton Glaser, famed for creating the "I ♥ NY" logo and the psychedelic Bob Dylan poster. Available on Amazon. 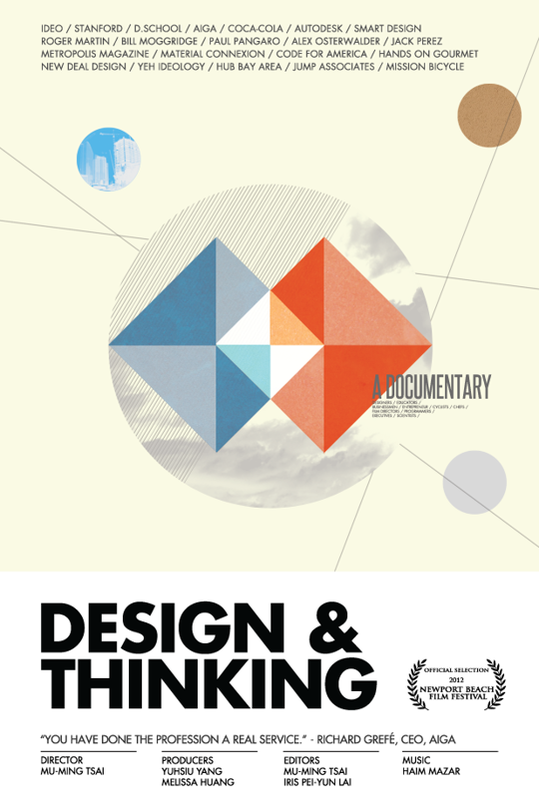 Inspired by design thinking, this documentary grabs businessman, designers, social change-makers and individuals to portrait what they have in common when facing this ambiguous 21st century. What is design thinking? How is it applied in business models? How are people changing the worldwith their own creative minds? It is a call to the conventional minds to change and collaborate. Art & Copy reveals the work and wisdom of some of the most influential advertising creatives of our time — people who've profoundly impacted our culture, yet are virtually unknown outside their industry. The husband-and-wife team of Charles and Ray Eames are widely regarded as America’s most important designers. But their personal lives and influence on significant events in American life – from the development of modernism, to the rise of the computer age – has been less widely understood. Narrated by James Franco, Eames: The Architect and the Painter is the first film since their death dedicated to these creative geniuses and their work. Sketches of Frank Gehry chronicles the friendship between director Sydney Pollock and the famed architect every bit as much as it does Gehry and his work, and it makes for a delightful window into the world of creativity and genius. [Gehry] possesses a singular vision and strong ego, which we view not only through the wide variety of his works, but also from interviews with friends, architecture critics, and clients, including artist Ed Ruscha, Hopper, L.A. talent manager Mike Ovitz, architect Philip Johnson, and others. In 1967, at the end of a career spanning more than six decades, which included the design of the Seagram Building in New York, the Lake Shore Drive Apartment Buildings in Chicago, and the Neue Nationalgalerie in Berlin, architect Mies van der Rohe (1886-1969) designed a simple gas station near Montreal. The story of that gas station serves as the point of departure for Regular or Super, which examines Mies' entire body of work (more than 70 buildings) and a sparse style that reflects his motto that less is more. Narrated by Dustin Hoffman, Visual Acoustics celebrates the life and career of Julius Shulman, the world’s greatest architectural photographer, whose images brought modern architecture to the American mainstream. “If you can’t find it, design it” is the motto of the Vignellis, whose renowned work ranges ”from the spoon to the city.” Kathy Brew & Roberto Guerra’s film brings us into the Vignellis’ world, capturing their intelligence and creativity, as well as their humanity, warmth, and humor. In the early 1960s, Herb & Dorothy Vogel – a postal worker and librarian – began purchasing the works of unknown Minimalist and Conceptual artists, guided by two rules: the piece had to be affordable, and it had to be small enough to fit in their one-bedroom Manhattan apartment. They proved themselves curatorial visionaries; most of those they supported and befriended went on to become world-renowned artists. Herb & Dorothy provides a unique chronicle of the world of contemporary art from two unlikely collectors, whose shared passion and discipline defies stereotypes and redefines what it means to be a patron of the arts. Hundreds of gallery owners have flocked to Miami via Art Basel, Untitled Art Fair, Scope Miami Beach, Pulse Miami Beach, etc. In addition to making sure their booth stands out in a sea of booths within an even larger sea of art fairs, parties and spectacles, many gallerists are focusing on bringing highly curated furniture into their spaces. "When we began doing art fairs 20 years ago, because of my particular interest in architecture and design, we always regarded the furniture in the booth to be as important as the art in the booth,” says the art dealer Sean Kelly. Clients and art lovers often come with particular taste and seeing a plastic chair next to a priceless work of art doesn't sit well. What a good opportunity to showcase your sense of style, or partner with a fabulous designer.